You can select to receive inbound fax notifications directly to your system by callback. When this feature is set, InterFAX places a call to a pre-defined web application URL of yours once a fax is received for you. Your web application should be capable of accepting either an HTTP POST call or a XML Web Service (SOAP) call - based on your preference. Once your app is alerted of an incoming fax, you need to collect the fax image by using the API. You can also set the system to send you feedback notifications on outbound faxes. For more information, please read the outbound callback documentation. The web application should contain a web method named "Inbound". (*) please note, InterFAX only supports URLs using standard ports -- 80 and 443. Integer The type of message. Currently sends out static '1'. Integer The number of pages received in this fax. DateTime The time and date that the fax was received in GMT timezone. 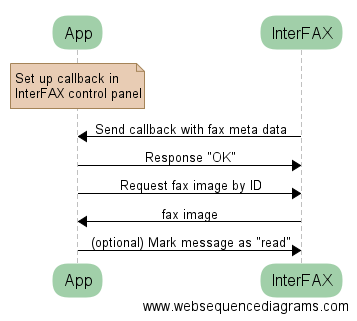 Once your application has received notification that a new fax has arrived, it needs to collect the fax image from InterFAX servers using the API of your choice. You may also mark your fax as read via the API, but this isn't compulsory.